While I was busy travelling to and from Denver’s Rocky Mountain Con, Gryphon Games and Comics in Cheyenne, Wyoming, and generally gearing up for Veterans’ Day, I took a moment to sit and chat for a while with one of Tiger on the Storm‘s toughest if not biggest supporters, Sgt. Garry Owen Kilroy Nutcracker, US Army. Valerie: How about if we begin by telling us a bit about your background? Sgt. Nutcracker: I don’t even know where exactly I came from, whether I was made in the USA or imported from China. But that doesn’t matter quite as much as what I actually am. I’m constructed out of a composite of many different kinds of wood, but my sap and pith are all American. Valerie: I understand your patriotism. What drives your interest in Tiger on the Storm? Sgt. Nutcracker: It’s really simple. The Air Force 23rd Tactical Fighter Wing flies A-10 Warthogs. Their Warthogs were first really put to the test in Operation: Desert Storm back in 1991. From then on through today, the Warthogs and their pilots have performed admirably, their close air support and search and rescue capabilities saving the lives of thousands of Marines, soldiers, and anyone else on the ground taking enemy fire. As a cav officer, I consider the Warthogs and their crews our guardian angels. Valerie: Speaking of your rank, meaning no offense, sir, but where’s your rank insignia? Sgt. Nutcracker: I’d been so busy going everywhere like anyone with Kilroy in the name does, that I got promoted and still haven’t had time to have the proper stripes painted on. Valerie: … Mustache March being an Air Force tradition rather than Army, right? Sgt. Nutcracker: Exactly. And this clown painted it on my face while I was asleep. It’s not regulation, but I can’t take it off, so I look permanently like Robin Olds. I’m stuck observing Mustache March year round. Valerie: It may only be the beginning of November, but people are already gearing up for Christmas. How are you preparing for the holiday? Sgt. Nutcracker: Nothing. I’m a Nutcracker, so people already think I’m just a Christmas decoration. But I’m actually out all year round. I do have advice for people who are jumping the gun on Christmas, though. Take it easy and keep in mind that Christmas can be tough on some people. Don’t forget that there’s also Veterans’ Day. Think about doing something nice for some Marines, Airmen, Sailors, or my fellow soldiers. 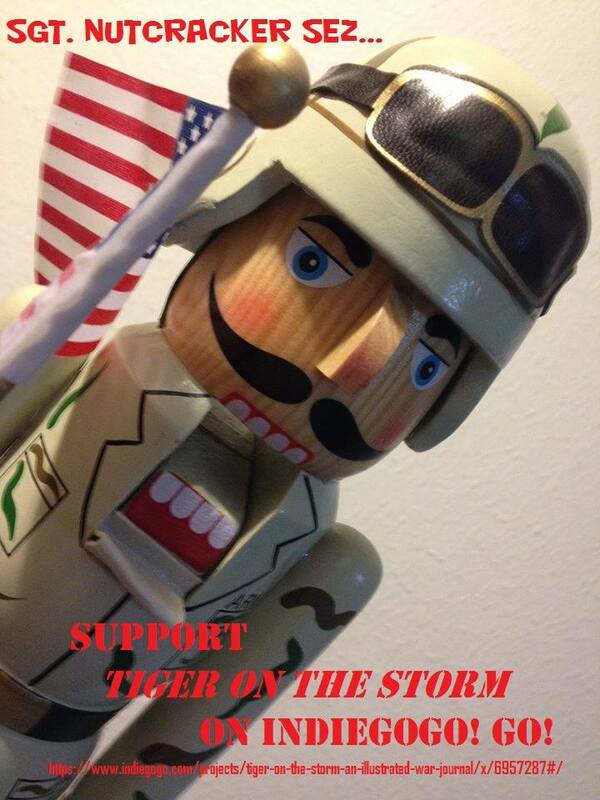 And if you’re already thinking about Christmas presents, a good one would be supporting Tiger on the Storm. The 25th Anniversary of Desert Storm, as you well know, is coming up on January 15. Everyone who served there and their families should appreciate that they are being remembered. Are you going to post the link? Valerie: Absolutely. As “Sgt. Nutcracker sez,” go to Indiegogo to help Tiger on the Storm go to print.